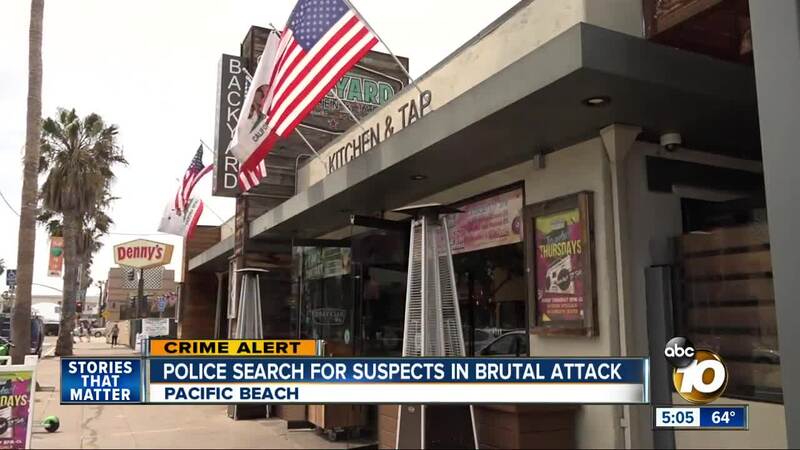 SAN DIEGO (KGTV) — San Diego Police are asking the pubic for help identifying a group of suspects they say assaulted a male outside a Pacific Beach restaurant this month. Police said the victim got into an argument with a group of men outside Backyard Bar and Grill on Garnet Ave. on April 1, at about 1:30 a.m. During the argument, one of the suspects punched the victim in the face three times. After the victim walked across the street to get away from the group, the suspects followed him and repeatedly punched and kicked him while he was on the ground, police added. The victim was taken to a nearby hospital with major head and facial injuries. He underwent reconstructive surgery of his face due to the severity of his injuries, police say. The group of men fled before police arrived on scene. Anyone with information about the suspects is asked to call San Diego Police at 858-552-1700 or Crime Stoppers at 888-580-8477.